Badger's Great Pumpkin Patch - 9122 North Elyria Rd., West Salem - 419 846-3818; open through October; daily from 8am to dusk; offers hayrides, pumpkins, a petting zoo, and a straw maze. Cleveland Metroparks - Chalet at Valley Pkwy, between Rts. 42 and 82 in Strongsville; 440 572-9990; Saturdays and Sundays in October; hayrides leave every 1/2 hour. Enderle Family Farm - 756 River Rd., Huron - 419 433-4856; free hayrides and corn maze on the first three Saturdays of October; 11am - 5pm; also sells pre-picked produce and pumpkins. 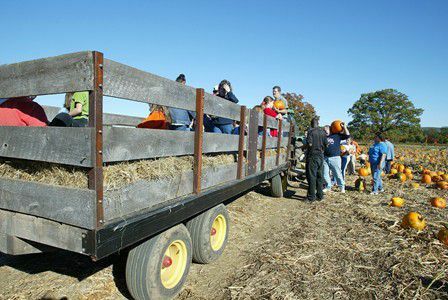 Heavenly Hill Farm - 18375 State Rd., North Royalton - 440 237-8708; offers pick-your-own apples, free weekend hayrides(Saturday and Sunday noon to 4pm), a kids corn maze, pumpkins, Amish pies, and cider. Luther's Farm Market - 5150 Alger Rd., Richfield - 330 659-2526; offers hayrides, a petting zoo, and a pumpkin cannon; open Saturdays and Sundays through October. Mapleside Farms- 294 Pearl Rd., Brunswick - 330 225-5577; offers horse-drawn hayrides and pony rides as well as a child-sized haybale maze, a snack and refreshment stand, pre-picked produce, and a gift shop. October 1 through 31. May's Farm - 4357 Alexander Rd., Randolph - 330 325-7796; offers tractor-pulled hayrides as well as kids face-painting, a petting zoo, a corn maze, a gift shop, and pre-picked produce. Patterson's Apple Farm - 11414 Caves Rd., Chesterland - 440 729-1964; offers wagon-drawn hayrides to a pumpkin patch; open weekends from mid-September through October. Ridgeview Farm Market - 5488 Kinsman Rd., State Route 87, Middlefield - 440 693-4000; offers hayrides, a corn maze, pumpkins, a petting zoo, and an Amish lunch stand; open Saturdays and Sundays from mid-September through October.